Have you ever seen astounding wildflower images of Colorado's mountainous region and wondered where they were taken. Often a vague reference to Colorado's western slope is all that's mentioned. Well, this guide will give you detailed directions and maps to specific wildflower hot spots where you'll use more memory than you thought possible. You'll also learn of other photogenic subjects (waterfalls and lakes) in the wildflower regions. 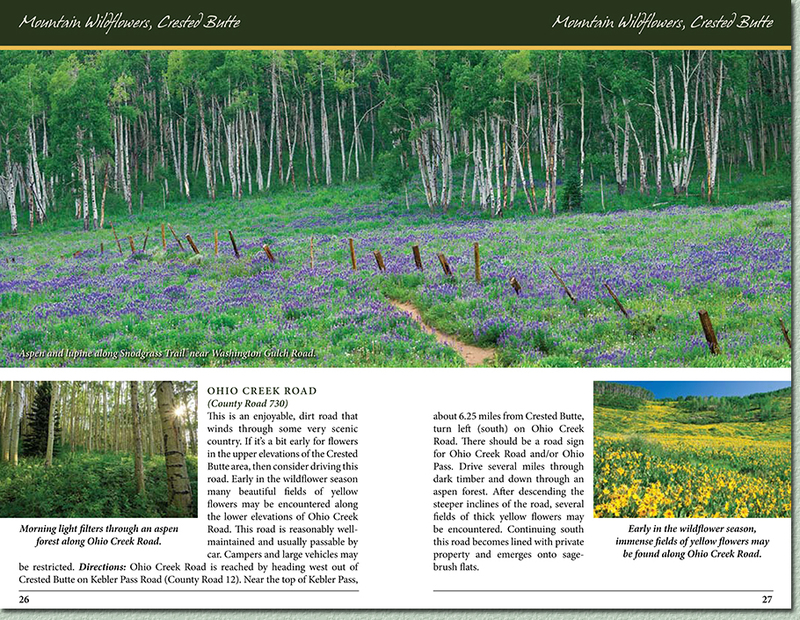 Below is pages 26 & 27 from the Colorado Wildflowers section of the book. The following is a sample paragraph from the Colorado wildflower photo locations section of the book. American Basin is a beautiful location to visit and one that is regularly photographed. You can 4-wheel directly into the heart of this dramatic location. Many flowers are present here, but I feel it is one of the best columbine hot spots in the state. Directions: Drive east out of Silverton on County Road 2; most maps also show this as Hwy 110. You'll travel through Eureka (about 7.5 miles from Silverton); in about 4 more miles, you'll approach Animas Forks. Veer right toward Engineer Pass, which will be marked by a sign. In about 1/2 mile, turn right toward Cinnamon Pass. Here the road becomes a little rougher and has precipitous sections; a 4-wheel drive is recommended. Proceed up Cinnamon Pass and descend the other side. In less than 1/2 mile after descending to tree line, turn right on Forest Road 12 (expect to begin seeing flowers here) and follow to its end at a trailhead parking lot. Total distance to American Basin from Silverton is about 18 miles. Columbine may be abundant near the parking area and many more exhibited a short distance up the trail on the east flank of the basin above the trail.